I just looked through the search terms that people use to find my blog. It is obvious that most people accessing this page are scared and looking for answers about a parent or other close family member going through, or about to go through heart surgery, an Arctic Sun therapy, or a stroke. It breaks my heart to see some of the search terms, because I understand and empathize with your pain, confusion, and frustration. I don’t think this page will give you the answers for which you are looking. It is a record of the events that my father, mother, and I went through, along with our friends and relatives who stayed updated via my blog. It is a snapshot of one family’s experiences, and yours will likely be very different. In addition, my father’s surgery was very complicated. It involved two valves being replaced, a MAZE III procedure, and, while they were in there anyway, a triple bypass. The cumulative risks of those added up to a 1:20 chance of not making it through the very lengthy surgery (11+ hours). Unfortunately, my dad drew the short straw, and ended up hitting that unlucky 1 chance in 20. The odds were that he should have made it. His chance of dying in the next two years without the surgery was nearly 100%, and his quality of life up to that point would have been very poor. He wanted the chance at a better life, so I still think he made the best decision. Looking back on this 1.5 years later, I can say that this was a hellacious time our lives, and I would not wish it on anyone. There’s rarely a day that goes by when I don’t think fondly of my father, and I often have a little regret for the lost opportunities we might have spent together. However, time has mostly dulled the pain. My mother and I have a much closer relationship (and it always was a good one), and so too with other relatives and friends. We value the time we have together more, and we are more aware of how precious each moment is. We try to schedule more fun times each week, stress about things less, and live life more in the moment. We honor the memories and lessons of the past without trying to cling to them, and without regretting what we missed. We try to plan for the future without fretting about it. If there is one lesson I can pass along, it is to be prepared for the worst (get your legal and financial affairs in order before you need them, know everyone’s final wishes, and be on good terms with the people you care about), and pray/hope for the best. It’s really all we can do. Oh. And always remember to tell the ones you love how much they mean to you. Sometimes you don’t get another chance to do so. I did with my dad, and that makes everything so much easier to deal with. Good bless you and your loved ones. May you find peace, comfort, and strength for whatever lies ahead. My father passed away on June 6, 2012 due to complications from a stroke following open-heart surgery. My mother ended up severely anemic at the same time, and I nearly lost both of my parents. While my father is now gone, I will continue to keep family and friends updated on how my mother and I are doing here on my blog. I don’t want to have a lot of private details archived on the Internet forever, so some details will be kept a bit general. If you are family, you can contact me directly (use my 596 number) for more detailed information if you like. Non-family and family can keep in touch by posting comments below or e-mailing me. Keep checking back and scroll down the page, as I will just update this one post as details change, rather than creating several small posts. I also plan to keep this post around, along with my dad’s memorial page. Tomorrow (Wednesday) is my dad’s pre-op day (tests, etc. ), which will take 4-5 hours. Then, he comes home for one more night. His check-in time for the surgery is at 5AM on Thursday the 17th–way too early for sane people, in my opinion. We don’t know how long his surgery will last, but many hours at least. He is scheduled to remain in the hospital for the next 10 days before he gets to go home. We all appreciate the warm wishes, prayers, and healing energy. We are still at the hospital. The wonderful nursing staff in the cardiac support unit has completed all of their blood tests, pre-op questions, review of medications, and education. Now we are waiting for my dad’s cardiac surgeon to finish up a surgery and come by for a final review and consultation before tomorrow’s surgery. After that is done, we get to swing by X-ray before we can leave for the night. Tonight, we are going to have Old Spaghetti Factory for dinner (before he is stuck eating hospital food for 7-10 days). He has to take a shower, followed by a special antibacterial body scrub. In the morning, he has to repeat the body scrub, take a few of his medications, and be at the hospital by 5AM. Following check-in and some more tests, they will wheel him away to the operating room sometime between 6:15 and 7:00. His surgery should last for about 8 hours (!!!). They recommend that my mom and I leave for about 5 hours, and be back by 12:00-12:30, and wait until the surgeon comes out to give us an update. After that, we can go eat, and in an hour or so, we will get to see him in the Cardiac Support Intensive Care Unit (CSICU). Their goal is to get him out of CSICU and into the Progressive Care Unit in about 2 days. He will then be in PCU for about 5-7 days. While in PCU, he will receive physical therapy and other support, with the goal of getting him back home and to normal living by the time he is discharged. Worst case scenario, if he does not quite meet those goals, then he will be discharged into a skilled nursing facility for a little more care. The cardiac surgeon met with us. He was pleasant, as usual. He went over a few points, checked on a few vital stats and some of the information in my dad’s chart, and then wished us well tomorrow. Went down to Radiology for the chest X-rays, and then we left the hospital. We had our Old Spaghetti Factory dinner, watched the DVD that the hospital sent us home with, and reviewed some of the plethora of information they gave us. Dad gathered his personal items together for us to take down later (he won’t be able to use them until he is out of the ICU), and then took his two showers (the second one with special antibiotic scrubs), and went to bed. We have to wake up in a few hours so we can be back at the hospital by 5AM. Now it’s time for the waiting game. They did the pre-op prep for my dad (asking all the standard questions [most of them for a second or third or fourth time], checking his vital signs, hooking up his IVs, and giving him a sedative. They wheeled him to the door of the CSICU, we said our emotional farewells, and then the doors closed and in about an hour (7:45ish) they will begin the surgery. My mom and I went down to the cafeteria for a light breakfast, and we are going to head home and try to get a few hours of sleep. We are supposed to return around noon, though the surgery is likely to run until 2:45-4:45 PM. Nothing new to report. Just waiting in the surgery waiting area. The volunteer at the desk asked a nurse to check in on my dad, which she did. Everything is going fine so far (yay! ), but it will be another hour or two at least before he is out of surgery (sigh). Talking with the volunteer (who had been a nurse for 30 years before becoming a volunteer for the past 15), she told me that valve repairs always take longer than valve replacements. I remember that the doctor was going to try to repair one of his valves rather than replacing, but if the repair didn’t work, then he would replace it. Anyway… we continue to wait. Great news! His surgery is completed! They still have to move him from the operating table to a gurney, wheel him into the CSICU, hook him up to all the equipment, and then we will finally be able to see him. That should be in about an hour. Thank you everyone for your support. The next 10 days are still quite risky, but at least the lengthy operation is past. Mixed news this morning, mostly scary. They extubated my dad around midnight. By 3 AM they had him sitting up in a chair, talking, and interacting with the nurses. Suddenly, around 6 AM, he presented with a deficit in his right side–that’s doctor speak for symptoms like a stroke in which he had weakness and inability to fully control the muscles on the right side of his body. This is similar to when he had a stroke back in 2000, and it is on the same side of his body. He’s undergoing a variety of tests, including a “CTA scan” (according to his surgeon, or a CAT scan according to his nurse) to try to determine if it is a blood clot (thrombosis), a chip of calcium (from replacing the calcified valve), or something else. A neuro-radiological specialist will be looking over the results. Also, my mom seems to be fighting an infection (lack of sleep, tons of stress, etc.). She’s exhausted and running a low fever. I will let you know more as we learn more. Very bad news to report. Just spoke with the neurologist. My dad did have a a fairly moderate stroke on the left side of his brain, which controls the right side of the body and communications. Due to the recent heart surgery, they can’t use the clot busting drug to get rid of it. They could go into the brain and try to remove the clot using surgical methods, but would likely cause greater damage to healthy parts of the brain, and the tissue beyond the clot is already in pretty bad shape, so they do not feel it is worth the increased risk. This is likely permanent. More info to come. It’s now a waiting game to see what happens with my dad next. He is responsive to external stimuli (talking, touch, sights, etc. ), and he seems able to understand yes/no questions that we ask him and respond by shaking his head. Can’t tell if he recognizes anyone yet or not, if he understands what the situation is, or anything else. He has tried to talk a bit, but its pretty much unintelligible mumbling at this point. Mostly, he’s just sleeping (snoring a little). We’re holding his hand and talk to him when he’s not asleep. That’s really all that can be done right now. His surgeon came by and said that this stroke is definitely more significant than his past ones. There’s definite damage done, and the question is how well dad’s brain can compensate for that and rewire itself to work around the damage. He has pulled through before. My mom and I remember that after his first stroke, he could barely communicate. It took about 5 years, but he was back to the point where anyone outside of family probably would never notice. After 10 years, he was pretty much 98% recovered. We’re praying for the same level of recovery again, and hopefully even a little faster. Then again, right now, I’d take 75% or even 50% recovery. But I’m not going to stop hoping for more. His surgeon said that the next 24 hours are critical ones, so please continue to keep him in your thoughts and prayers. We don’t want him to have another stroke on top of this one. Instead, we want him to start making some progress toward recovery. Nothing really new to report at this time. One bit of good news though… During a period when he really seemed lucid and aware of his surroundings, I asked him if he could close his eyes (something he wasn’t doing normally on his own), and he did it. So, I asked him to close his eyes if he knew who I was. He closed them again. It made me so happy. Of course, then I was sad thinking that this might be the only way we may be able to communicate in the future. But, I let that thought pass, and I focused on the fact that he did seem to recognize me. Most of the time, he’s just sleeping. Sometimes he’s a little restless and tugs at the wires to which he’s hooked up. When he does wake up, he usually looks over in my direction, kind of like he’s looking to see if I am still there beside him. I take that as another good sign. I am pretty sure that just a few moments ago he mumbled “my arm” (and he seemed to be trying to point to his right arm at the time). He hasn’t moved his right arm this whole time, so it’s probably suffering some (hopefully temporary) paralysis due to the stroke. It must feel odd to him. He still shakes his head no when we ask if he’s in pain. Nothing much new to report. It’s all about tiny incremental changes at this point. He did respond yes to a question by nodding (previously I only noticed him answering no by shaking his head). It also seems that his concern about “my arm” was because the wrist bracelets that they put on him when he came in, were quite tight due to post-surgical swelling (edema) of the arm. The nurse repositioned the bracelets lower, so that they are loose now, and the agitation went away. That’s great news, because it seems to indicate that he does have at least some sensation still in that arm. They are beginning to start their change of shift now, so I am going to head back home, have some dinner, and then come back later this evening. Thanks again for everyone’s prayers and warm wishes. They are truly what is helping my mom and me through this right now, and I’m sure they are helping my dad, too. Nothing new to report about my dad really. The night nurse told me that my dad did recognize him. At least he nodded affirmatively when he asked him if he did. Other than that, he seems about the same. It seems that we can’t catch a break at all. My grandfather (on my mother’s side and who lives about 225 miles south of us) ended up with a knee injury today. From what I gather (third hand), his morning caregiver somehow hurt his knee while trying to get him transferred from his bed into his chair. His evening caregiver found my grandfather’s knee so painful and swollen, that they called an ambulance for him and are taking him to the emergency room at the hospital. So, now it is three people in my family who are damaged or sick. It’s times like this that really make you question your faith and ask questions about why there is so much suffering in this world. I wouldn’t wish this stress on anyone else, but we certainly could do with less of it right about now. Someone asked me how they could help us out financially. I wasn’t sure how to answer that. I’m not the kind of guy who normally would ask for something like that, but I did ask the nurse how much it cost to be in ICU, and they said they thought it was around $7,000 PER DAY. gulp Given that, and all the rest that is going on health-wise, I created a PayPal donation button. It’s completely optional, and you should not feel at all obligated to donate anything. Your prayers and warm, healing thoughts are all that we are asking for. But, if you want to do a bit more, we will gladly accept any amount you might choose to send. PayPal deducts 30-cents and 2.9% of the total donation, so please donate at least $1 if you do make a donation. Have a good night everyone. More info tomorrow or earlier if something changes sooner. A little technical glitch delayed my update. Sorry about that. Mostly good news to report today. Yay! In fact, the only not-good news to report is that my father is still not back to full health yet, but that’s to be expected. Also, the lower-quadrant of his left lung is showing some fluid build-up in the x-ray. It’s also causing him to wheeze and gurgle a bit as he breathes. Now for the good news… He is able to cough, and that is good for his lungs. He’s even able to cough a bit when requested. He is able to move his right leg a bit (gross motor skills from the hip so far), and his right arm seems to resist gravity a bit when the nurse picks it up and lets it drop. Yesterday, it just flopped straight down, but today, he seems able to halt, or at least reduce the speed of, the fall before it touches the bed sheet. The nurse and I also saw him starting to move his fingers of the right hand a bit, which was a first. His chest tubes are still draining a little, so they are going to have to transfuse 1 unit of blood into him to replace what he’s lost. He sat upright in the adjustable bed last night, but became agitated pretty quickly. They are going to try having him sit in a chair later today. They are also planning to begin feeding him liquid nutrient through a tube tomorrow if things continue to improve. That should help him to regain his strength. Right now, they are just keeping his fluids and electrolytes balanced, but no supplemental nutrition yet. More good news… my grandfather has no broken bones in his knee. It appears to just be a bad sprain. They did admit him overnight for observation. My uncle (on the East Coast) is working with his caregivers this morning to figure out how to care for him after he is discharged. The caregivers think he might need to go to a rehab facility to help him recover more fully. Finally, my mother’s fever broke last night, and she’s feeling better today. She’s at home trying to get some extra rest. I’m pretty happy right now, but I remember from my dad’s stroke in 2000, that little successes are often followed by little setbacks. But those are followed by more successes. I’m sure it’s going to be a bit of an emotional roller-coaster ride over the next several months. I’ll report more when there’s something new to report. The neurologist just came by. He showed the pictures from my dad’s CT scans. There was no bleeding, but there were significant areas in the left hemisphere where there was no blood circulating due to the clot. The affected areas are the ones responsible for speech (taking concepts and turning them into words) and movement of the right side of the body. The doctor was encouraged that he had been able to form a few words so far. The doctor also felt that dad was able to squeeze the doctor’s fingers a little bit using his right hand; another good sign. The neurologist’s biggest worry is that dad could still have a bleed in the brain. The doctors also are concerned with his breathing. Dad’s surgeon also came by to check on him. He reiterated most of what the nurses and the neurologist had said. The surgeon did seem mildly optimistic that dad would be able to begin receiving some nutrition tomorrow, so that he can start building his strength up. The physical therapist (PT) came by. He helped dad get up and transfer to a chair for two hours. He did that primarily under his own power, which is a significant milestone. After the two hours, though, he was too tired to return to the bed on his own, so they used a sling to get him back into bed. He’s sleeping now, completely tuckered out. Small steps along the road to recovery. Dad seems to “ebb and flow” (as one of his nurses describes it). Sometimes Dad is quite responsive, able to cough on demand, is quick to answer questions, eyes focused. Other times, he almost looks to be in a near vegetative state, but he still remains responsive and is able to answer yes/no questions.Sometimes it seems like he’s asleep, but then he starts moving around like he’s awake. Other times, he looks somewhat awake, but is snoring away. It makes it difficult to really tell how he’s doing. I live for those lucid times. During an earlier one, I think he even tried to give me two smiles. At least, that’s what it looked like to me. Ideally they would have removed his chest tubes today, but he’s still got a bit more fluid than they would like coming out, so probably it will be another day or two just to be safe. They are definitely taking things easier with him than they typically do, because they do not want any more damage to happen. On the other hand, risks of lung infections, bed sores, and other things increase if he doesn’t make steady progress. Dad is currently only on aspirin for blood thinning. If he gets moving around a bit more soon, then that’s probably where he will stay. If he remains somewhat immobile, the doctors might have to start giving him something else so that he doesn’t develop clots due to staying still. Both his neurologist and cardiac surgeon are actively involved in his care and monitoring his condition. They both seem like really nice and really knowledgeable professionals. Perhaps the best thing of all is that he seemed to try to tell my mom “I love you”. It was mumbled, but when we asked him if that’s what he’d tried to say, he nodded yes. It’s been a busy morning. Physical Therapy (PT) came back and put my dad in a chair again. He was able to lift his right leg on command–not very high, but an improvement over yesterday. His right hand and arm did not have as much control, but still a slight improvement over yesterday. A speech therapist from Occupational Therapy (OT) gave him a swallow evaluation to see if he could handle drinking liquids and solid food. Unfortunately, he failed that test. They are going to insert a feeding tube in him for now so that they can start giving him some nutrition to help improve his strength and stamina. The main reason he failed the test is that he continues to fade in and out a bit, and when he fades out, he forgets to swallow the ice chip in his mouth. Anything more substantial could result in aspiration (inhaling food or liquid into the lungs) or choking. They will reevaluate him again to see if/when they can switch him over to regular food. Also, when the speech therapist asked him to answer some basic questions like his name, where he is, etc., he shook his head no. He seems to know the answers, but can’t put those thoughts into speech yet. However, the fact that he seems to know the answer and occasionally can string thoughts together into words is a good sign that he will continue to improve. Nobody knows just how far or how fast. He’s going to be put back into bed now, and he’ll probably sleep for the next several hours if he’s as tuckered out as he was yesterday. It’s been a busy and productive day with a lot of positive improvements! I’ll save the best news for last. As I mentioned above, PT had him sitting in a chair for about three hours today, and he did really well. We went home while, he slept for several hours. When we came back, they had removed the Swan-Ganz catheter (aka pulmonary artery catheter) from his neck. They also removed the compression bandage from around his right leg (where the vein for his bypasses was used). They were planning to remove his chest tubes today, but a lot of pooled fluid drained out when they sat him upright in the chair. Since then, not very much has drained out, so, if that remains steady, the tubes should come out tomorrow. His blood sugar is doing better, and they lowered the amount of insulin they had been giving him. His blood gasses also continue to look quite good. He is doing much better with his coughing, and even seems to be swallowing what he manages to cough up (rather than it staying stuck in the back of his throat where they have to suction it out). He is still being paced externally (i.e., an external pacemaker-type device is keeping his heart rate steady). When they turn it off, his heart rate drops into the 30s or even the teens. For comparison, his pre-operation/pre-stroke resting heart rate was in the 50-60 bpm range. This is fairly common for patients who have had a maze procedure. Adding to that, the stroke could be affecting his heart’s performance as well. They will continue to monitor it, and, if necessary, install a pacemaker if his rhythms do not improve on their own. The neurologist will be off for the next few days, but he ordered a new set of CT scans to be taken tomorrow to check for any new problems and to compare with the previous set. He said that we could take a disc home of the pictures if we like–and if we fill out the appropriate paperwork. Gotta love that paperwork. In the previous post, I mentioned that they would be adding a feeding tube, but actually they just hook the feeding tube up to his existing nasogastric tube. A little machine pumps a steady supply of some liquid nutrient into his tube, and thus into his stomach. The hospital uses disposable single-blade razors to shave patients, so one of the nurses recommended that I bring in my dad’s electric shaver and use that instead. It was very weird shaving my father. I remembered him teaching me to shave with a blade, but now I am shaving him. An interesting turn-around. I also swapped out his hearing aid battery, which I think was dead or nearly so since it’s on all the time now. He is much more alert. He still fades in and out, but he’s out for shorter periods of time and returns more quickly and more fully. The neurologist said that this type of fading in and out is relatively common following any type of large trauma to the body, and dad suffered two almost at once (the surgery and the stroke). We should continue to see marked improvements day by day as the body recovers. He is using both of his arms more. We explained to him that if he would leave his tubes and wires alone, then they would remove the light restraint that they had on his left arm. He nodded agreement, and the restraint was removed. He’s reaching around with that hand now, feeling things, adjusting pillows, scratching itches, and (carefully) adjusting his nasal oxygen tube. He also is using his right hand a bit to assist his left hand. Sometimes he crosses both hands across his chest, looking much more comfortable. He is paying much more attention to things going on around him. The solar eclipse was shown on the TV news, and every time the images were shown on the screen, my dad would focus on the TV and seemed to follow the story. This is the first day he’s paid any attention to the TV at all. He has always been an astronomy buff, and he’d been looking forward to seeing this eclipse for a while. I’m so glad that he was able to see it. And now for the two best bits of news… He is trying, and succeeding, in talking more! Me: You just keep getting better, ok? Me: You just said, “I’ll try”?!? Me: You said, “All right”? He also told the nurse “All right!” after she undid his restraint and he could move his left arm freely. Mom did not come to the hospital with me this evening. I did call her on the cell phone, and then held the phone up to his ear so she could talk with him. He recognized her voice and probably what she was saying. He started mumbling back to her. Then, he reached up with his left hand, took the phone out of my hand, and held it over his ear. He tried to talk back to her (he could only mumble at this point), though it did seem that he might be saying “I love you”. After a while, I asked him if I could have the phone back. He kept it pressed to his ear. I asked him again, and he looked me in the eye, and handed the phone back to me. It was the most touching and complex thing he’d done yet. We repeated the process by calling my aunt. He said (a little mumbled, but still fairly clearly) “Hi” and his sister’s name. My aunt talked to him a bit and asked him some questions. He responded to every question, but neither of us could understand what he actually said. Overall, his improvement today has been remarkable, and we are all so happy to see it. Does that mean a setback tomorrow? I hope not. But I do remember that it’s a series of ups and downs when dealing with stroke recovery. But I will savor the good news of today and hold onto it through the tougher days. If you have messages of hope and encouragement for my dad, or you want to share a memory with him, please feel free to do so here. Until tomorrow then… Good night! A quick little update. Dad is doing well today. They gave him another CT scan this morning. No results back yet. Kind of mixed news to report. Dad is still doing pretty well, and he is still making slow, steady progress. He seems much more aware of his surroundings and situation. Unfortunately, he also seems to be getting frustrated at his lack of progress and maybe a bit depressed about suffering another stroke. Despite that, his vocabulary seems to be expanding a bit. He’s able to smile a bit stronger now, and I did not notice any difference between his left and right side of the smile (i.e., the right side did not seem droopy like it did after his first stroke). However, he still did not pass the swallow test, so he still has to be fed through a tube. Tomorrow is another day, and we’ll see what it brings. What a difference 12 hours makes. Dad is not doing very well this morning. We haven’t been by to see him yet, but the nurse said that he is not very responsive, not really participating with his therapy, not making much eye contact, and not moving his right side. He’s also gone from needing almost no oxygen, to needing 100% oxygen via a mask during the night, and back down to 80% currently. They do not know if the lack of oxygen is causing the symptoms, or if the lack of oxygen is a symptom of another problem. They are running tests and consulting with the neurologists and cardiologists trying to figure out what’s going on. As always, but especially now, he could use prayers and healing energy sent his way. I absolutely hate the days when things go downhill. After seeing dad doing (relatively) so well last night, to see him in this barely responsive state is discouraging. The neurologist (not the original one, unfortunately) told us that he wasn’t overly concerned with dad’s condition. As long as dad remained “rouseable”, he should be fine. Since there was swelling showing in yesterday’s CT, that’s probably all that this is. Unless the swelling pushes into the right hemisphere (thereby making him unrouseable), he should be ok. Swelling following a stroke usually peaks around the 4th or 5th day following the stroke, so he’s right in that window. It usually takes 2-6 weeks for the swelling to completely go away. As it is, he’s mostly just lying there, tuned out to most things going on around him. He occasionally moves his left hand around a bit to scratch an itch, feel at something, or just kind of waves it in the air a bit. Sometimes his eyes (mostly his left eye) seems to focus on us. I like to think that he recognizes us, but I don’t have any way of verifying that. He is not speaking at all, and even nodding and shaking his head seems to be too much for him today. He will squeeze his left hand on command, but that’s about all he seems capable of today. Sorry about the delay in posting today. I just don’t know what to write. It’s has been a series of mini roller coasters. In some respects, he’s better than yesterday physically, but mentally he’s still pretty much out of it. Dad was running a fever this morning, but his white blood cell count was normal. They ran a whole battery of tests and took cultures trying to determine what might be causing it; nothing to report yet. They are keeping his fever down with Tylenol. Aside from an infection, the most likely cause of the fever is a side effect of the swelling and the stroke itself. Sometimes following a stroke, the brain can’t seem to lock in on 37.0C (i.e. 98.6F), and it can keep the body running a fever or subnormal for a while. We hope that is all that this is. They also had him hooked up to an EEG for a while to monitor his brain activity. If anything abnormal had shown up, they would have done a 24-hour EEG. Since they didn’t do that, we are assuming that his EEG was normal. They also took another CT scan, but the results still are not in. He’s off the hi-flow (pressurized oxygen delivery system) and back onto a regular nasal tube for supplemental oxygen. His blood gasses all look fine. In fact, his vital signs and basic tests are all coming back within normal parameters. Despite that, he’s still pretty much unresponsive. The nurse said that when they took him down for the CT, where the room is colder and the surface is hard, he became alert, looked around, and seemed to be trying to figure out what was going on. Once they got him back in his regular bed, he went right to sleep. He’s been pretty much like that the rest of the day. No recognition in the eyes, either. Though I did just call the nurse for an update before posting this (to see if there was any good news to post yet), and she said that she thinks that he is tracking her movement now (though she can’t be sure), which might be a sign of a bit of improvement. I’ve very little time, because we have to be ready to meet with his doctors to decide on a course of action. My dad’s MCA infarction (like a heart attack in the brain) is growing, and his doctors disagree about what to do about it. Therefore, we, the non-medically trained family members, are going to have to decide what to do. We need LOTS of prayers for wisdom and the best outcome, as well as continued health and support for my dad. Recommendations for top-not neurologists in the Sacramento area would be highly helpful, too. Sorry for the late posting, but we just got home about an hour ago. After an extra-long day at the hospital, I had to fix an issue with a server at church (with mom in tow). The hospital day started out pretty much the same as the past few, though we could tell that dad was a little more alert. As we approached the hospital’s parking garage, the neurologist called us. He waited for us to park and come upstairs to meet with him. He took time to explain and show us the CT scans, telling us that the swelling in dad’s brain had increased some more since the last scan. He still believed that “wait and see” was the most appropriate course of action. We had previously called all of dad’s doctors letting them know that we were not happy with this neurologist, and that we wanted a second opinion. Our cardiac surgeon came through for us, at least a bit, because he consulted with a neurosurgeon on our behalf. While the neurosurgeon did not meet my dad or us, he did review my dad’s records and made a recommendation to the cardiac surgeon. Dad’s temperature had spiked during the last few days to around 39C (102F). That’s a very bad thing for someone with a stroke. Dad’s temperature was still running higher than it should. The neurologist’s suggestion was to use an Arctic Sun cooling system to keep his body’s core temperature lower. It seems to be doing its job. Despite the fact that dad ended us shivering and looking pretty uncomfortable, he became a bit more responsive. He is tracking us visually as we move around. He seems to understand what we tell him. He is starting to move all of his limbs again, too. He even patted me on the shoulder at one point. His cardiologist also gave us some additional insight into what’s coming up for my dad. He will be having a feeding tube installed in his stomach. The NG tube that runs through his nose and into his stomach, is designed only for up to 10 days of use. Beyond that, it can do more damage than good. Depending on whether dad can keep his airway clear and avoid aspirating or not, he may have to have a tracheotomy performed, too. Both of those procedures can be temporary or permanent, depending on how well he continues to improve. Those are the highlights of the day, and we are so happy that we pushed for a second opinion. While we would like to replace his neurologist, we still don’t have a replacement lined up yet. The cardiac surgeon and cardiologist are going to work together to try to find someone who is available and willing to work with my dad. We received a call from his current neurologist. My dad was given another CT this morning (I hate that he’s getting so much radiation), and the swelling has grown some more. He also asked if the family has asked for the Arctic Sun procedure to be stopped. Obviously, we hadn’t, so he was going to have it reinstated right away, as well as giving my dad a light sedative to help with the shivering. Also, the neurologist had consulted with neurosurgery to see if they had any thoughts about the swelling. They said that a procedure to remove bone from dad’s skull to allow the pressure to swell outside instead of his head instead of inside was contraindicated (recommended against) for a couple of reasons: it’s a highly risky procedure that would not improve his functional outcome (it could potentially save his life if the swelling was bad enough, but not improve the outcome otherwise) and his age (over 50 the risks usually outweigh the benefits). Other than that, he sounds pretty much the same. He appeared to be watching TV during the night, according to his nurse. Mom and I will be heading back down to the hospital this afternoon to see for ourselves. Our cardiac surgeon feels, like we do, that dad is just miserable being chilled to the core, shivering, and not seeming to fully understand why. If we are going to more aggressively try to bring the swelling down in his brain, then we need to really be aggressive about it. We agreed with the surgeon’s recommendation to re-anesthetize dad, intubate him, and really chill his core temperature. Essentially he will be in a medically-induced coma for a few days. The intubation will keep him breathing, and also help to clear out his airways (which have been an ongoing area of concern). Then, on Monday or Tuesday, they will check his brain with another CT scan to see how the swelling is doing. Hopefully at that point, they can let his core warm back up to normal, bring him out of the coma, and then get him breathing off-tube again. It’s almost like we are resetting the clock back to the night following the surgery, just with that dang stroke hampering his recovery. This is the best, most aggressive treatment that his doctors have been able to come up with that is relatively safe and has a good chance of improving his condition and keeping him comfortable. It’s all quite scary, but we are praying and keeping our fingers crossed, too. “No news is good news” is what they told us while dad was in surgery. In this case, I guess it’s more of a “no news is no bad news”. I really don’t know what to say or to write. Dad is not in as deep of a “coma” as we thought he was going to be. They have him under sedation, so he’s deeply asleep. They have him intubated and hooked up to a breathing machine, the Arctic Sun is wrapped around him keeping him cool, and a new feeding tube was routed through his mouth alongside the breathing tube (less prone to infection and supposedly more comfortable). His blood gasses look good, as does the rest of his blood chemistry. We’ve talked to a lot of different people, and we have come to understand a bit better about what is going on inside his brain, and it doesn’t sound good. Most people understand that when something (blood clot, a tiny chip of calcium, etc.) blocks a blood vessel, the healthy tissue on the other side of the blockage becomes starved of blood, and, if not corrected in a very short amount of time, the tissue can die. That is referred to as an infarction. When it comes to brain tissue, once it is infarcted, there is no way to repair it, restore it, or regrow it. In a small enough stroke, the brain can often reroute nerve impulses around the damaged areas of the brain–people can often learn or relearn how to do things, thus making new pathways between the working parts of the brain. My dad’s initial stroke in 2000 did all of that, and he created new pathways so that he was back to about 98% of his old normal after 12 years of struggling and fighting to regain what was lost. The latest stroke attacked pretty much the same part of his brain as the first stroke–the mid-cerebral artery (MCA). That is like the trunk of a tree, which has lots and lots of branches and smaller limbs running out from it. Since the stroke this time was in a more major part of the MCA, more areas of the brain are affected. Swelling in the brain is a fairly common side-effect following a stroke, with peak swelling occurring in the 4th-5th day following the stroke. Dad’s brain continued to swell, thus the reason why we we have been working to reduce the swelling. As the brain swells, it damages the tissue, and the infarction increases. This was something not clear to us initially. We thought that the swelling was temporarily reducing his ability to speak, protect his airways, etc. Instead, it sounds like all of this is likely permanent. That’s not to say that there isn’t still a bit of hope, but sadly, that hope is growing very dim. We are still going to see this treatment through. It seems to be our last and best option left. His CT scan today showed essentially no change from yesterday (a positive sign). We will see what the doctors say on Monday or Tuesday after they run a battery of tests on him, including more CT scans. We’ll find out what his mental state is then, as well as his prognosis. When he is awake (they deliberately wake him once per 12-hour shift to assess his mental state, which is why I am down here at 12:30-2 AM), he still seems to recognize us. He’s sleeping again, so I am going to go home and do the same now. I’m not sure what happened to the original of this post. I guess I didn’t hit the “update” button after typing it. So, here is what I remember of it. Once again, nothing has really changed. Mom and I sat with him while they turned off the sedative and he woke up. We talked to him for about 1.5 hours, and he seemed to comprehend what we were saying, though he couldn’t do more than squeeze our hands and make very vague, but seemingly appropriate, facial expressions. The only significant change is that his heart is no longer externally paced; it’s beating on its own now with a nearly normal sinus rhythm. It seems that our cardiac surgeon and the third neurologist had a bit of a disagreement over my father’s treatment plan today. They came to a compromise, and changed some of his medications. It doesn’t seem to have worked out for the better though. In fact, after tonight’s visit, I’d say it had exactly the opposite effect. Tonight, dad never seemed to fully awaken from the sedation. Normally, after about 20 minutes of the nurse shutting off the sedative, dad wakes up–a bit groggy at first–and we can ask him to squeeze our hand, move his feet, and track a moving finger. Tonight, it took over an hour for him to even open his eyes. Once he did, his gaze was pretty vacant most of the time. He didn’t seem able to track a moving finger or the nurse’s penlight. He squeezed our fingers, but it was rather spastic, with his fingers acting more like a crab’s claw, pinching at us, rather than a full squeeze. His right-side movement was limited to a twitch of the right toes, and nobody could tell if it was voluntary or involuntary. He started shivering from the Arctic Sun treatment, so we gave up for the night. This was a dramatic change from the past three days, it seems to us that the likeliest cause is the change in his treatment. He will have more X-rays done tonight (we didn’t know it, but they have been giving him nightly chest X-rays since intubating him to check for problems) and a CT scan in the morning. We’ll see what that shows. We hope that we can talk to the surgeon tomorrow to see what our weekend-long aggressive treatment’s results are. Dad is a little more responsive than he was Tuesday morning, but still less responsive than he was over the weekend. We have not been able to talk to the cardiac surgeon directly yet. However, he and the neurosurgeon that he consults with have talked. They agree that the swelling in dad’s brain seems to have stabilized, and that the best course of action right now is to wait a few days and see what happens as the swelling goes down. That sounds hopeful (and we do still have a spark of hope for an 11th-hour miracle), but the reality seems to be that my father, my mom’s best friend and husband, my aunt’s brother is pretty much gone–mentally at least. Unless there is significant improvement by the end of the week, we probably will change from treatment to comfort care. We know that dad was unhappy with the quality of life that he was living prior to the heart surgery. That was the driving force behind his decision to undergo the surgery. If he hadn’t had the surgery, he would have had only 1-2 years left, and those would have been pretty miserable for him, since he couldn’t do the things he wanted to do. We also know that he did not want to live if it meant being hooked up to tubes and machines until the end of his time. He wanted a fighting chance, and we are giving him that. But, the reality is that we have to prepare for the worst, while still hoping for a positive outcome. We were finally able to speak with the cardiac surgeon today. He seemed about as frustrated with the neuro team as we are. The neuro team has been pressuring us to put in a PEG tube (permanent feeding tube) and an ET tube (permanent breathing tube) in my dad. Our doctor thinks that it is a little premature to make that decision, because we don’t even know what dad’s new “normal” baseline is. So, we took him off of the sedation today, and they are going to extubate him in the morning. We will wait through the weekend and reevaluate his condition on Monday. Other than that, not really much to say today. It turns out that they did not extubate dad today; they will do so tomorrow morning instead. Dad is definitely awake tonight, though it is difficult to tell how “with it” he is mentally. He seems to recognize us, but it’s really hard to say so empirically. He can do simple things like blink his eyes and (weakly) squeeze my hand on request; however, trying to do two or more of something (like blinking or squeezing twice) seems to be beyond his ability. Also, more complex instructions, like blink for yes or squeeze for no, are beyond his ability and/or comprehension. Also, he seems to respond to the request to blink or squeeze regardless of what he is asked. Therefore, it’s pretty much impossible to tell what is going on in his mind. Once the breathing and feeding tubes come out tomorrow morning, he might be able to communicate a bit better. According to one of the nurses, sometimes patients avoid moving because the tubes are uncomfortable. We’ll see what changes tomorrow brings. Sorry that there was no update last night. There was simply nothing new to report. There’s still nothing new to report. He’s still intubated, because the cardiac surgeon decided to keep him on the ventilator for a few extra days while they try to dry out the secretions in his lungs a bit more. He wants to give did the best possible chance of recovery, since we do not plan to re-intubate him if things go badly. We all agree that we want to do everything we can to that end, but after this, we’re going to leave it all in God’s hands. If dad survives off of all life support, then that’s what is meant to be, and if not, then that is. Like you, all this waiting is nerve-wracking for us. All the ups and downs of before were frustrating, but, in some ways, this new status quo is every bit as frustrating if not more so. Especially since we’ve been told “tomorrow; it will be tomorrow” for three days in a row so far. No change in dad yesterday. They will be extubating dad’s breathing tube in a few moments with orders not to reintubate him, even if things go poorly. Our goal now is to determine dad’s new baseline following last week’s aggressive treatments to try to reduce the swelling in his brain. The swelling has stopped, and now that he has had the ventilator tube removed, his body temperature is down to normal. His breathing is quite raspy, but that is likely a side-effect of the breathing tube. When we arrived today, dad was much more alert and aware than he has been in over a week. He seemed to recognize mom, me, and a dear friend of ours who is also a pastor. We talked to dad for a bit and passed along some of the messages that people have written to him. When we showed him some of the get-well-soon cards people have sent, he actually reached out, grabbed each card in his left hand, and held it up to look at it. His eyes teared up a bit a few times during all of that and when we told him we loved him and wanted him to get better. He is still unable to do a repeated action reliably, like squeezing his hand twice or moving a finger twice. He also does not seem to be able to answer a yes or no question. However, he did try to communicate with us. Unfortunately, we could not understand most of what he tried to tell us. He pointed to his mouth and then waved his hand, pantomiming wanting to talk, then pointed to his head and kind of shrugged. That, at least, was perfectly clear to understand he wants to talk with us but can’t form the words. When the nurse saw him interacting with us that much, she thought that he might be able to point to letters or pictures to try to communicate. She brought in some charts, and we tried. Unfortunately, he was worn out by this time, and he dropped off to sleep. For the rest of the afternoon and into the evening, he mostly slept. He never tried to communicate with us again while we were there. After he is off the ventilator for a while, we will see how he is doing mentally. If he seems able to make competent decisions, we will ask him if he wants us to continue working to keep him alive. We know that dad did not feel that a life hooked up to a bunch of machines was much of a life, and he did not want to exist in that artificial sort of way. If not, or if he is unable to make that decision, we will follow his advance directive decision and request that the remaining connections be removed, that he be given comfort care for pain, and let God and nature take over from there. What a difference 8 hours makes. Dad, unable to protect his airway, has developed sepsis (a massive internal infection), resulting in a high fever, chills, and shivering. The x-ray they took this morning is showing darkening and thickening in his lung, which means pneumonia is setting in, too. Since dad is suffering, and we do not want him to suffer, we asked them to switch dad to “comfort care” or “palliative care”, in which they will give him morphine to keep him pain-free and to avoid the sensation that he’s drowning in his own secretions. His status is now “DNR” (do not resuscitate) instead of “full code” (which he started at) or “limited code” (which meant not to reintubate him). So, when his breathing or heart fails (whichever gets him first), the nurses are not to try to revive him. The respiratory doctor expects that he will not last more than 12-24 hours at this point. So, that’s that. We’d prayed that God would help us with our decisions and to give dad whatever he needed. While it’s not the outcome for which we’d hoped, we can only trust that it is the best outcome in this situation. It also is consistent with my dad’s wishes not to go to heroic methods (like keeping him hooked up to a ventilator) to keep him alive. When we arrived at the hospital, they had dad on a light dose of morphine to take the edge off, but he was still awake, and he recognized us. We talked with him a bit, told him how much we loved him, and to not worry about us. He should just go to sleep and that we would make sure that he was not in pain. We said our goodbyes (without actually saying those words–too hard to say them). He actually reached over and patted mom on the head in farewell. The nurses increased his morphine and gave him a sedative. He’s now sleeping peacefully, except for some occasional coughing. We are leaving for a while to take my mom to the doctor for a checkup. The stress has been pretty hard on her. Then we are coming back later. We just can’t seem to catch a break. At mom’s doctor’s appointment, we found out that she is quite anemic. So much so, that her doctor insisted that she check herself into the E.R. tonight right after leaving his office. Since he does not have privileges at the hospital where my dad is (Mercy), she is supposed to go to the one that the doctor prefers (Sutter). We went down to Sutter, wondering how we on Earth we would manage family in both hospitals simultaneously. The E.R. turned out to be overstuffed, with a really long wait. We told them our situation, they checked her in, and then started triage. Our friend, the pastor, met us at Sutter. The nurse talked to a doctor. While that doctor definitely thinks that mom needs to be seen in the E.R. tonight, it wasn’t critical that she be seen at Sutter or right then. So, against medical advice, we checked her out and all of us returned to Mercy. 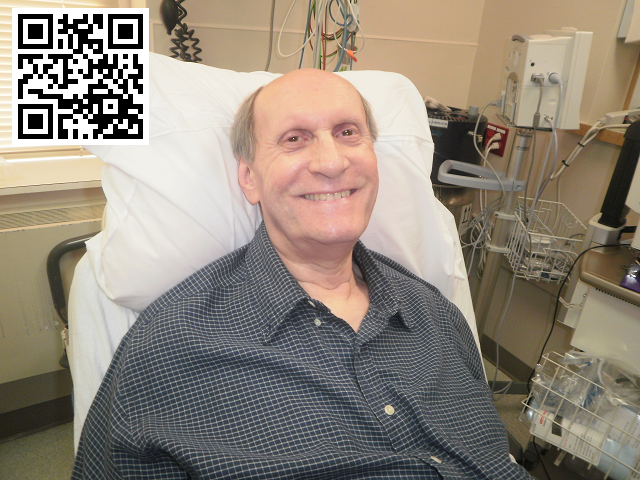 Dad is still doing poorly, but is fairly stable. He is not in any pain, and it is back to waiting again. We sat with him a while. Our friend said some more prayers for my dad and for us. We’re having a bite of dinner right now, and then we will go back to see dad. If he’s still stable, then we will check out Mercy’s E.R. and see how long the wait is. For mom’s condition, they are likely to give her a transfusion of blood and run tests. They might keep her overnight, too. So, I may be here all night, bouncing between my mom and dad. Life sure can be tough. Dad passed away peacefully at 1:46 AM. We were down in the E.R. getting mom taken care of. I got the feeling that it would be a good time to call up to the CISCU and check on dad. The nurse said that his vitals had just started falling. We checked out of the E.R. (again, against medical advice), came upstairs, and moments later, dad flatlined as we said our goodbyes. Now we are going back down to the E.R., where they have a bed waiting for my mom. She needs 2 units of blood, so that will be another 4 hours in the E.R. After being in the E.R. all night, Mom was admitted to the hospital around 5AM. Spending all night in the E.R. is never fun (we’ve done it before with Dad). We were stuck with an E.R. doctor who had a rather condescending attitude who seemed to know better than anyone else could possibly know, what was wrong with the person. We noticed he took the same cocky attitude with his other patients. Fortunately, because of our “delay” in treatment with Dad, another doctor came on duty, and he was far more inquisitive, sat down with us, and took the time to run additional tests and weigh different treatment options. Now that she’s admitted, she has a different doctor yet. She’s on the second unit of blood now, and already feeling better and looking a lot better. It looks like she probably will be going home later this morning or early this afternoon, depending on whether just 2 units of blood will do, or if she needs 3. They are pretty confident that the anemia was caused by nothing worse than an infection, so they are giving her a strong IV antibiotic, to be followed up at home with prescription antibiotic pills. Naturally, they want her to follow-up with a regular doctor for monitoring and additional tests. It turned out that mom needed a total of 3 units of blood to restore her to a safe enough level that they could discharge her from the hospital. She’s still well below the “normal” lower limit, but at the threshold of a “safe” limit. They also gave her the IV antibiotic and a prescription for antibiotics to continue taking at home. During the transfusion, we finally caught about 1.5 hours of cat naps (more drowsing than sleeping due to all the interruptions and noises). Aside from that, we have been up for about 36-hours. We are safely home and completely exhausted. We’re going to sleep in and try to lessen our huge sleep debt a bit. Thank you for all the prayers, warm thoughts, and kind words for my dad, my mom, and me. It means the world to us. I’ll post a bit more sometime tomorrow. The antibiotics seem to be working well for mom. She’s still tires easily, but she is definitely much improved. We should get some more test results back tomorrow, and they may adjust her treatment plan based on the new information. She has a follow-up appointment with her doctor on Tuesday. She’s still looking for a primary care physician in the Sacramento area–preferably with either the U.C. Davis and/or Mercy medical groups. The doctor that she was referred to by a friend is closing his practice soon, so he is only temporary. The doctor needs to be accepting new patients who are on Medicare. Unfortunately, most practices we’ve been referred to are not accepting new patients, or if they are, not ones with Medicare as their primary insurance. This is true in Visalia where my grandparents live, too. It’s very frustrating. While mom stayed home and caught up on some paperwork and other things that had been put on hold, I took care of the arrangements at Lombard & Company, the mortuary that will be handling dad’s cremation, and did a bunch of other errands and some shopping. It’s amazing how much stuff you run out of when you spend nearly three weeks at the hospital! One of our friends called today to express their condolences, and he asked where he could send flowers. Please don’t. First of all, my dad did not wish to have them–he would rather have you make a donation on his behalf to the California State Parks Foundation at http://www.CalParks.org or The Nature Conservancy at http://www.Nature.org. Secondly, my mother and I are allergic to many flowers, especially lilies (which are traditional in funeral arrangements). Thirdly, dad wanted to keep things simple for the family and his friends, so there will not be a public memorial. The family will be getting together to have a private ceremony sometime after his cremation. Your comments on the new memorial page for dad are greatly appreciated, and as lasting testaments, they would mean more to us than flowers that would shortly fade. So, if you were planning on sending flowers or attending a memorial, thank you, but instead please leave a message and, if you like, support one of dad’s favorite causes on his behalf. Several people have asked us today how we are doing. It’s difficult to put into words. While we miss him terribly, and we are reminded of him frequently as we move around our home or do things we would normally do with him, we actually are at peace. We had a month before his surgery to prepare for his possible death. Then we had nearly three weeks of ups and downs, hope and hopes being dashed, and all the rest that already squeezed out many of our tears. However, the moment we had dreaded the most–the actual time of his death–was not bad at all. It was, in fact, very peaceful. We know that he is in a better place, without pain or handicap, and with loved ones who preceded him. It was cathartic. It brought closure to nearly two months of the the hardest decisions and worst emotional turmoil we have suffered in a year that has brought us many challenges. We are stronger for it, and we will not only survive, but thrive. We will miss dad dearly, but we are ready to move forward. We still have many ongoing challenges to face, and some new ones (like probably needing to move in order downsize our living expenses). Nevertheless, we know we have incredible support from family and friends–both old and new. So how are we doing? We’re okay. And we’re going to get better as time goes on. Dad would have wanted that for us. And we hope that all of you are, too. You've all done a great job in dealing with your dad's condition and getting the info out to all of us who care about Dave. We are keeping you all in our thoughts, and hope for the best outcome for Dave. My heart is breaking.. please know that you and your mom are in our prayers. Please give your dad a kiss goodbye for me and tell him thank you. Our prayers are with you and your family and for Dave. Will, we just got home and got the latest update. If he wakes up, let him know the group sends him their love and honor him for going where no Warped Spacer has gone before, also, we expect a few stories finished and waiting for us to join him so we can review and discuss. Hope this last part gets a smile. Love and thoughts to all, and let us know if you need anything. He will be missed, and he will be remembered. My prayers for you and your mother.